Researchers at the University of New South Wales have proposed a new way to distinguish between quantum bits that are placed only a few nanometres apart in a silicon chip, taking them a step closer to the construction of a large-scale quantum computer. Quantum bits, or qubits, are the basic building blocks of quantum computers - ultra-powerful devices that will offer enormous advantages for solving complex problems. Professor Michelle Simmons, leader of the research team, said a qubit based on the spin of an individual electron bound to a phosphorus atom within a silicon chip is one of the most promising systems for building a practical quantum computer, due to silicon's widespread use in the microelectronics industry. 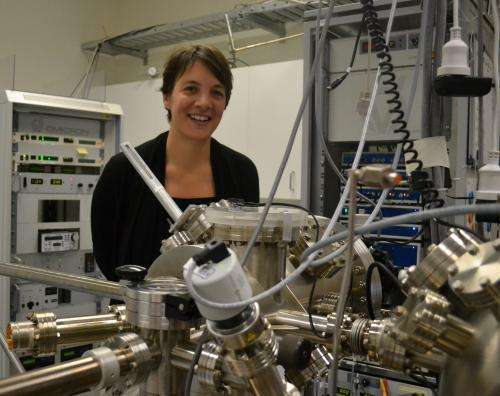 "However, to be able to couple electron-spins on single atom qubits, the qubits need to be placed with atomic precision, within just a few tens of nanometres of each other," she says. "This poses a technical problem in how to make them, and an operational problem in how to control them independently when they are so close together." The UNSW team, in collaboration with theorists at Sandia National Laboratories in New Mexico, has found a solution to both these problems. Their study is published in the journal Nature Communications. In a significant feat of atomic engineering, they were able to read-out the spins of individual electrons on a cluster of phosphorus atoms that had been placed precisely in silicon. They also propose a new method for distinguishing between neighboring qubits that are only a few nanometres apart. "It is a daunting challenge to rotate the spin of each qubit individually," says Holger Büch, lead author of the new study. "If each electron spin-qubit is hosted by a single phosphorus atom, every time you try to rotate one qubit, all the neighbouring qubits will rotate at the same time – and quantum computation will not work. " "But if each electron is hosted by a different number of phosphorus atoms, then the qubits will respond to different electromagnetic fields – and each qubit can be distinguished from the others around it," he says. The UNSW team is part of the Australian Centre of Excellence for Quantum Computation and Communication Technology, a world-leading research centre headquartered in Sydney, Australia. "This is an elegant and satisfying piece of work," says Professor Simmons, centre director and Mr Büch's PhD supervisor. "This first demonstration that we can maintain long spin lifetimes of electrons on multi-donor systems is very powerful. It offers a new method for addressing individual qubits, putting us one step closer to realising a practical, large-scale quantum computer." To make the tiny device, the researchers deposited a layer of hydrogen on a silicon wafer and used a scanning tunnelling microscope to create a pattern on the surface in an ultra-high vacuum. This was then exposed to phosphine gas and annealed at 350 degrees so phosphorus atoms became incorporated precisely into the silicon. The device was then buried in another layer of silicon. In a quantum computer information is stored in the spin, or magnetic orientation, of an electron. This spin can not only be in two states – up and down – just as in a classical computer. It can also be in a combination of both states at the same time, allowing exponentially larger amounts of information to be stored and processed in parallel. Great discovery-University of New South Wales proposed some new features in Quantum Computing/computation method previously but this one is awesome. Silicon is widely used because of it's diode require 0.7V drop across it before it start conducting while phosphorus requires only 0.3V drop across it before it start conducting-this is why silicon is used widely in microelectronics(chip is widely used).